American scientist Josiah Willard Gibbs made important scientific contributions to mathematics, physics, and chemistry in the 19th century and was even called “the greatest mind in American history” by Albert Einstein, the German-born theoretical physicist who relied on Gibbs’s theories for many of his own later discoveries. Gibbs’s work had a profound influence on 20th-century science and his work in statistical mechanics laid the groundwork for the development of physical chemistry as a science. 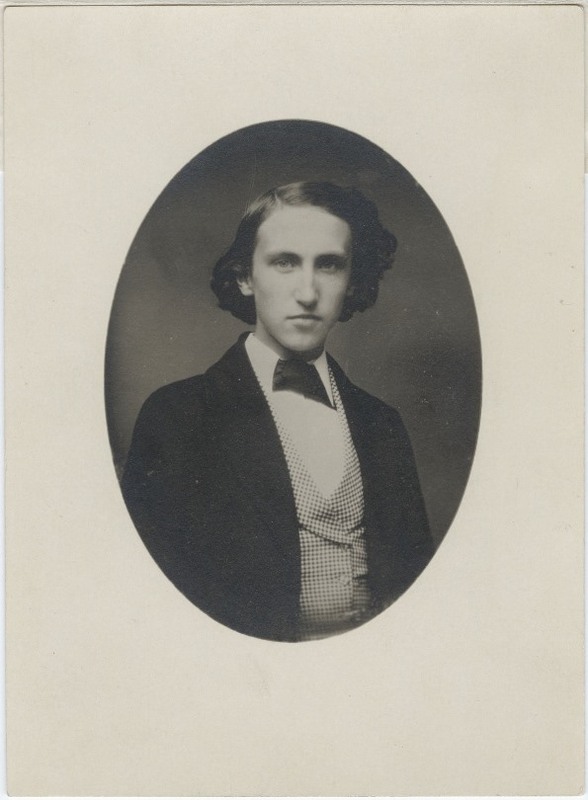 Josiah Willard Gibbs was born in New Haven on February 11, 1839, the only son of five children born to Josiah and Mary Anna (Van Cleve) Gibbs. Gibbs came from a prestigious family of clergymen and academics and his father was a linguist and theologian who is best remembered as the abolitionist who found an interpreter for the African captives on the Amistad–thus allowing them to testify during their trial. At the age of 15 Gibbs entered Yale College. Excelling in mathematics and Latin, he graduated in 1858 near the top of his class, and at age 19 received induction into the Connecticut Academy of Arts and Sciences. He remained at Yale for his graduate education and in 1863 received his doctorate—the first PhD awarded in engineering in the United States. After graduation, Gibbs became a tutor at the school and taught Latin and natural philosophy (physics). In 1866 he patented a design for a railway brake, and five years later became a professor of mathematical physics at Yale College where he remained for the rest of his life. 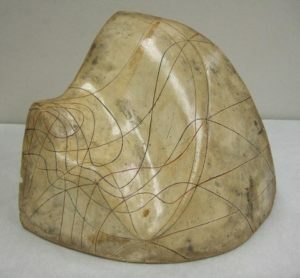 When Gibbs was 34, Transactions of the Connecticut Academy published his first work on the geometric representation of thermodynamic quantities. In the years that followed, he was published many more times, and in 1875 and 1878 the Connecticut Academy published his monograph (in two parts). The book, On the Equilibrium of Heterogeneous Substances, contained hundreds of mathematical equations and became the basis for establishing physical chemistry as a science. Josiah Willard Gibbs made significant scientific contributions at a time when theoretical science was not easily understood or popular. Much of his research received little recognition, although he was elected into the National Academy of Sciences, he received the Rumford Prize from the American Academy of Arts and Sciences for his work in chemical thermodynamics, and in 1901 he received the Copley Medal (perhaps the most esteemed international medal of the time) from the British Royal Society. Gibbs never married and apart from summering in New York’s Adirondack Mountains and New Hampshire’s White Mountains, and a European stay in the 1880s, he rarely left New Haven. He lived there (in the house where he was born) with his sister and her husband (who was also a Yale scholar). Gibbs died relatively young, on April 28, 1903, at the age of 64, from an intestinal obstruction. He received a burial in New Haven’s historic Grove Street Cemetery. 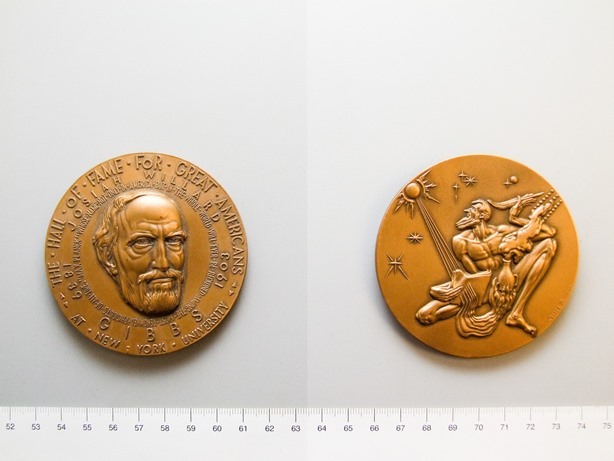 In 1912, with the help of German physicist Walther Nernst, a bronze bas-relief memorial, designed by sculptor Lee Lavrie, was installed in the Sloane Physics Laboratory at Yale to honor Gibbs’s life and work. In 1950, Gibbs received induction into the Hall of Fame for Great Americans, and, later, the United States Navy named an oceanic research ship the USNS Josiah Willard Gibbs. Perhaps most interestingly, a look up at the moon (near the eastern limb) provides a glimpse of the Gibbs Crater, named in his honor in 1964. “J. Willard Gibbs.” American Physical Society, 2016. Link. “Guide to the Josiah Willard Gibbs Papers.” Yale University, Beinecke Rare Book & Manuscript Library, 2016. Link. “Guide to the Josiah Willard Gibbs Research Laboratories, Yale University, Photographs.” Yale University Library, Manuscripts and Archives, 2016. Link. Hastings, Charles S. Biographical Memoir of Josiah Willard Gibbs, 1839-1903. Washington, DC: National Academy of Sciences, 1909. Link. Wheeler, Lynde Phelps. Josiah Willard Gibbs, the History of a Great Mind. New Haven, CT: Yale University Press, 1951. Slosson, Edwin E. “Willard Gibbs, Physicist, 1899-1903.” In Leading American Men of Science. New York, NY: H. Holt and Company, 1910. Link.